Thank you CCP Commander Wang. Question for you: when we encounter bugs in specific areas of the map, we haven't been able to report them because we have to say something like, "the hill by the thing next to the other thing but just around the corner". So a lot of bugs we see you don't get specifics. With these screenshots, will it be ok for us to use programs such as Paint (or whatever) to draw circles and upload the new images to show where exactly the issues occur? I'm guessing this is ok, but I like I like ot be 100% sure ahead of time. Because of the NDA you will not be able to. The map feedback forum currently only allows devs to post images. We will consider other options in an official feedback suggetion thread that I will post shortly. If each image of the maps had their edges numbered then we could give you the coordinates of the bug encountered. Suggestion, how about CCP adds some grid lines to the image. Saying "the diagonal roof at A4", is a lot easier than saying "The diagonal roof just a little north west of the centre building"
Hard to play lonely,but very good map for teamplay. My suggestion for this map is to put some structures around the MCC drop location east of A to give those dropping down some cover. As it is, if the opposing side forces us all the way back to intial spawns the only viable option is the buildings to the southeast. This. Grids. It would also allow more interesting tactical planning. That seems like a logical, although temporary, solution. Good map but need more people in it. Fun to run around from point to point. And the ship at the center lets know that the battle goes for him. As I understand it must be so is always more difficult to attack than defend. Arrived in the sector and there you have, and defense around? No will be too easy then. But if in the future will have an opportunity choose where to attack in the map and establish defenses to decide all by itself. And I like it. Stop trying to to make of CoD and BF please comrades players. It is, but if the minimap actually contained a mini map, and had grid lines/coordinates on it as well, it would make coordinating the battle much easier in game as well. A negative aspect from this map is the lack of sectors to safely bring vehicles. I usually require someone to watch over me as I send RDV requests. out of all the maps, ashland is by far the best. It is fair for all specializations unlike Manus peak. I think something needs to be done about the turret near C in the center of the map. You can lock down pretty much the whole map with it and use it to camp spawns in 3 different objectives at the same time. I'd suggest either changing it to a Large Rail Gun or removing some of the cover that's around the turret so it can be destroyed with a Swarm Launcher from objective E to level the playing field a little. i target that gun as soon as i can. it's usually the first thing i destroy on the map. it's equal distance from both sides and can be an effective asset to who controls it. Its possible on the top of the silos located to the south of the map to shoot though barricades designed for infantry protection. Confirmed weapons so far laser rifle. Possible attribution to lag and client not updating physical positioning of the shooter as standing would allow for shooting over the barricade. Even in the southeast spawn location, you can be camped by a good dropship pilot. If your team is getting redlined, both spawns are awful on that side of the map. The northwest spawns are much easier to protect if you are getting redlined. It might be hard to spawn at the MCC, but you can spawn at the top spawn and be relatively safe. A bigger building on the southeast spawn would solve this issue I think. Found ya Pyranos! And yes, I do agree, that side of the map gets redlined so easily, so I make it a point for my corp to rush C just so we don't get wrecked early. Thank you all for the feedback so far we really appreciate it. Below are some comments from our level design team on Ashland map. 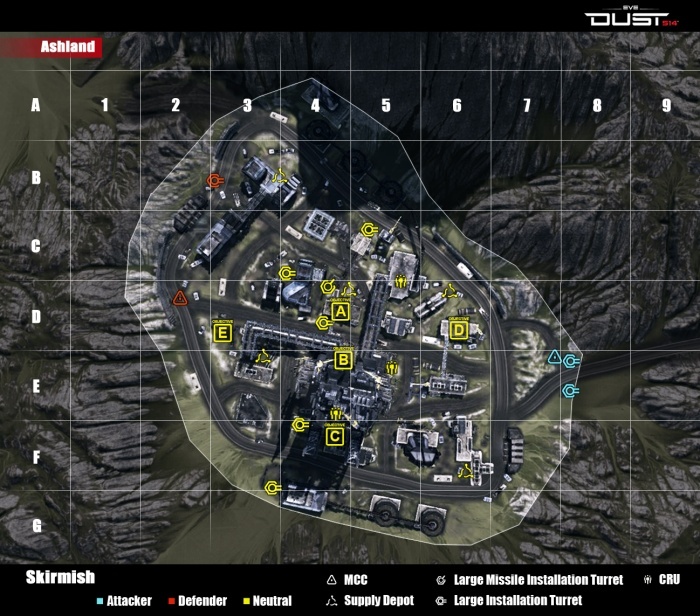 LD: Hi everyone, we would like to address the issue of spawn camping in the Ashland skirmish mode. We realize it can get problematic but we do have a fix planned for this and it will be implemented as soon as possible. We are also aware of the concern about the lack of air cover and we would like to hear your feedback on where you feel they are most needed and discuss this further with you all. Underground maybe? Say from near but not on an Null Cannon to a way-point area like the CRUs. Probably best if it go's around the outside of the center complex as it's a death sentence to get caught in the lanes between those smaller structures on the outer areas of the map by a Drop ship. yeah! more underground paths! I love them in the orbital cannon map. They add room for close quarters combat but cover from air. The underground path could end with a huge ladder going up to a sewer cap opening near one of the points. Or maybe let us in some of the buildings? Just some sort of covered travel where it makes sense. There Needs to be more enterable buildings. Right now I get the feeling that CCP is trying to avoid doing this, but it is neccesary. there are a lot of cool buildings but it will be dissappointing knowing they are all mostly set peices. yea more enterable buildings would be nice not just for this map but many maps.. also maybe place some unmannable ground and Air turrets (i.e. ground to ground and ground to Air) and with cover initial spawn locations so that it is possible to not get spawned camped either by an enemy tank or dropship.... another suggestion i am going to make is a Command Point cap for bringing vehicles on the map.... currently in 16v16 maps being able to have more than 1 heavy tank on the field is highly disadvantageous especially to new people yesterday on the 5 point map the enemy had 3 Heavy tanks on the field... now if this was a 128v128 map i certainly would not have a problem but 16v16 is quite a bit unfair.... if you wish to add a Target Painting module (TP) used in conjuntion with say a sniper rifle that would both increase damage (because its target is more closely defined) against as well as add a lock on for homing missiles then in a 16v 16 i would have no problems with facing 3 tanks or a few dropships.... make the TP an R2 function on zooming in with the sniper rifle which the painter only works against vehicles/buildings... the TP would be broadcast to the entire team so those who have missiles can launch them straight into the air and they will then begin to home as soon as they have enough height to see the painted object the missiles obviously will have limited flight time can't make them too OP to be able to hit anything from the other side of the map.